The Sunrisers Hyderabad will clash with Chennai Super Kings in the first playoff of the IPL season 11. Hyderabad have finished at the top of the table after the group stage winning 9 of the 14 matches they played. The match will be played at the Wankhede Stadium, Mumbai. They were followed by the Chennai Super Kings who won 9 of the 14 matches they played in the group stages so far. Both the teams won the same number of matches amassing same no. of points and the net run rate decided their position in the points table. SRH dominated the tournament from the very start and were the first side to make it to the playoffs. However, they seem to have lost the heat in their last few matches. They have lost 3 of their last matches consecutively and will be entering this deciding stage with 3 defeats. IPL is a tournament where momentum is a significant factor. Their bowling, being arguably the best in the IPL this season has been struggling in their last matches. They have conceded more than 170 runs in all their last matches with an economy rate of 9.64. This is in stark contrast to their performances in the initial matches. CSK have been a dominating side this season as well just like all the other seasons. They started winning their matches with small differences but later improved and completely dominated the opposition sides. Under the commands of MS Dhoni, the CSK have been performing like a fine-tuned engine perform really well. The CSK's batsmen have been performing explosively and with consistent they have made a mark this season. Ambati Rayudu occupies fourth place with an aggregate of 586 runs, while MS Dhoni and Shane Watson are ninth and tenth respectively with aggregates of 446 runs & 438 runs. With so much at stake, the match will be a crucial one. 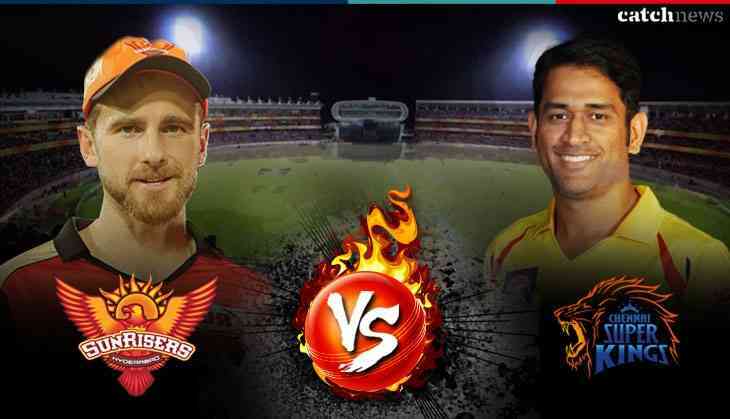 The teams are two of the best sides in the IPL this season and being in the playoffs, we can expect an interesting fight between the two champions in the race to the title.